Based on Stephen King’s THE SHINING. YOU CAN REQUEST a NUMBER! Just ask! 1 of 500 Signed Limited Lithographs. Includes the official Glenn Chadbourne / Stephen King gold seal. Sent rolled, in a tube, and then in a protective box and ready for framing. 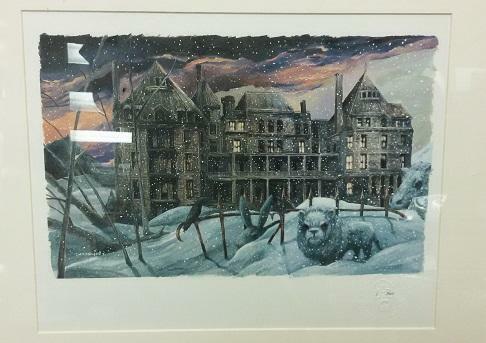 OVERVIEW: Reknowned Stephen King artist, Glenn Chadbourne, was commisioned by the Overlook Connection to create original artwork for The Shining and the sequel, Doctor Sleep, as a special dust jacket in honor of this historic event. We have the original framed here at the Overlook Connection main office, and now you too can have a personally signed lithograph on acid-free stock and ready for framing. We have an extremely unique opportunity for our Stephen King fans and artwork collectors thanks to our friends at the Overlook Connection: The Glenn Chadbourne Dark Tower Artwork Portfolio! 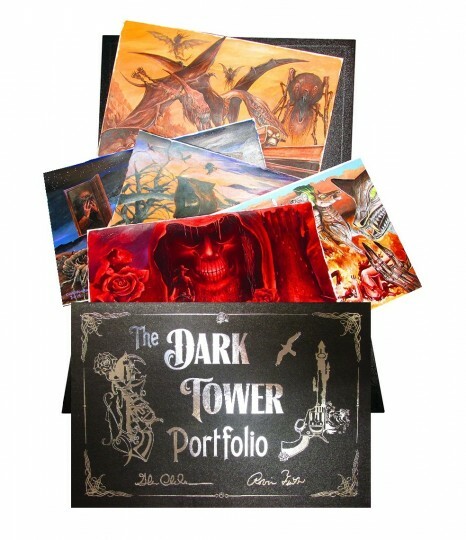 This portfolio is the culmination of over two years of thoughtful design and layout for wraparound paintings of each Dark Tower novel. This is part of the Overlook Connections’ New Stephen King Cover Series and they’ve gone one step further to give these paintings a one-time lithograph production, signed by artist Glenn Chadbourne and author Robin Furth, and housed in a unique hard-board, gate-fold, slipcase, with foil stamping. This is truly one of the most beautiful productions we’ve ever produced. The paintings featured above are just a few of the set to give you a sneak peek. All the paintings are new and original, but there is one more – An original painting of Mid-World – ONLY – available in this portfolio set, and signed & numbered by Glenn Chadbourne. Please place your order today because we will never have more to sell! by King artist Glenn Chadbourne! Limited to 100 Numbered Copies! 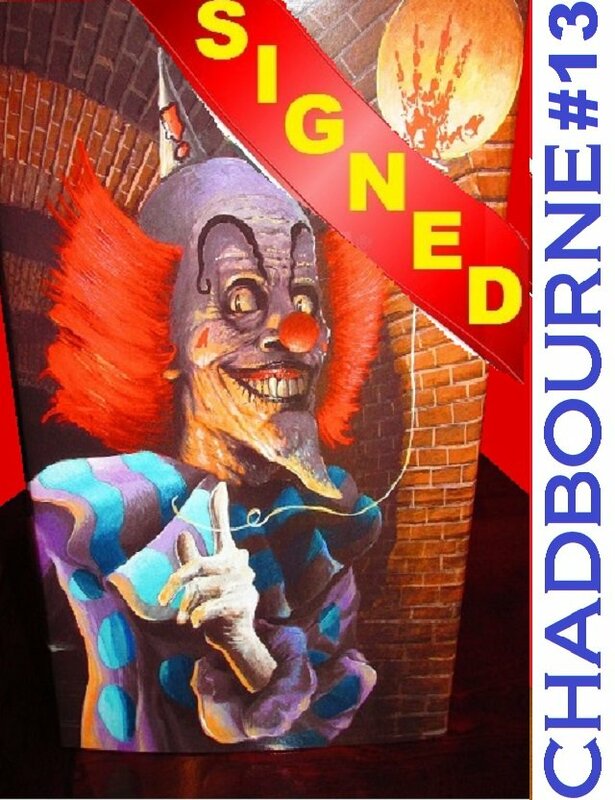 Remarqued and Signed with a Castle Rock image by Stephen King artist, Glenn Chadbourne! Original Remarque personally drawn on an interior page by Glenn Chadbourne – in color! You can see a sample remarque here, which you can request, you can ask for a scene, or Mr. Chadbourne will surprise you. Each copy is “embossed” with an original self-portrait art stamp created by Mr. Chadbourne on the title page of the book. The number of each copy is featured within Glenn’s “eyes” – see image for the example. First Printing Hard cover copy of GWENDY’S BUTTON BOX. 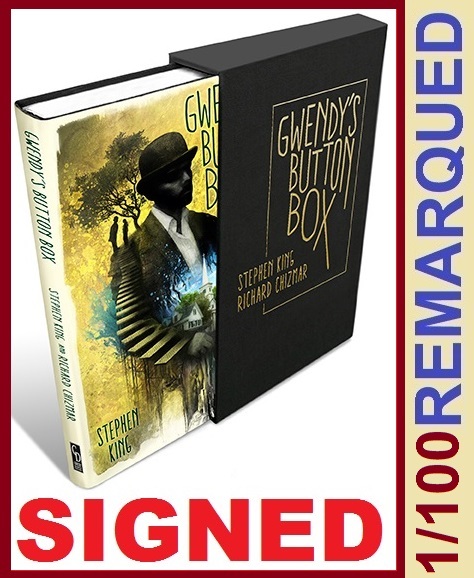 GWENDY’S REMARQUED BUTTON BOX – HERE! For a limited time, you can use the code SAVFEB17 to save 10% off purchases from the Chadbourne Stephen King New Covers Series from StephenKingCatalog.com! The Lincoln County News has a new article about Glenn’s latest project! “The Dark Tower Portfolio” is available at stephenkingcatalog.com. Only 1,000 copies exist, each signed by Chadbourne and Furth. Each sells for $125. Hinchberger is offering a discount to Chadbourne’s local fans: those who buy the portfolio at stephenkingcatalog.com and enter the code “save25gc” at checkout will receive $25 off. Twenty-six special editions, which include an original painting by Chadbourne and other custom features, go for $600 each. A portion of the profits from each sale will go to King’s Haven Foundation, which supports artists and authors in need.